A council chief executive has apologised to children, parents and staff over the closure of a new school campus in Dumfries on safety grounds. Gavin Stevenson said the community should have been celebrating the £28m North West Community Campus. Instead, the local authority shut the site on Friday after a child was struck by a smart board. Classroom by classroom checks are being carried out to see when pupils can safely return. Mr Stevenson said: "I am extremely angry and disappointed and I would have to apologise to the children, their parents, staff and the wider community. "They should be celebrating their new building and actually we are having to close. "So it is an absolutely disappointing situation for this council and the whole community." He said that Dumfries and Galloway Council had received "gold-plated assurances" over the building before it opened. Mr Stevenson confirmed that there would be no schooling until Thursday for primary one to S3 pupils. They will instead receive free access to some leisure facilities, such as swimming and football coaching. He said senior pupils would be accommodated at St Joseph's College and Dumfries High School "depending on the ability of the schools to take them". Alternative nursery provision is expected to be offered from Tuesday. The smart board incident - which contractors Graham said was down to the use of excessive force - was the latest in a string of problems. Before the school opened an error in fitting a sprinkler system was blamed for issues with a ceiling while last month another pupil was struck by a door. Parent Cameron Ross told BBC Radio's Good Morning Scotland programme his two children were now scared to go to school in case they got hurt. He said he believed the opening of the new complex had been rushed. "Why can they not just leave the kids in their old schools, take their time and build it properly?" he asked. "There is no rush in this whatsoever - open the school in October and, there you go, there are not going to be all these silly, stupid mistakes. "A board falling on a kid should never happen." Andrew O'Halloran, local secretary of the EIS, told the programme the union shared the concern of parents. "This is a cause of immense stress to the staff and the pupils of the community," he said. "The staff are already working very hard to prepare pupils for exams, their workload is incredible. "They don't need on top of that something which breaks education and breaks their bond with the community." He added: "The people of north west Dumfries deserve a state-of-the-art education facility and that is not what they are getting." He said the issue was complicated by the fact that pupils could not go back into their old schools due to vandalism or other occupancy. 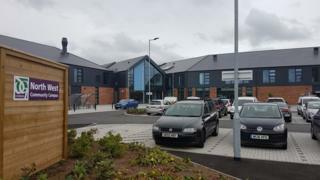 Dumfries and Galloway Council said an independent inspection was ongoing and it would await the findings of that before deciding when staff and students could return to the campus.